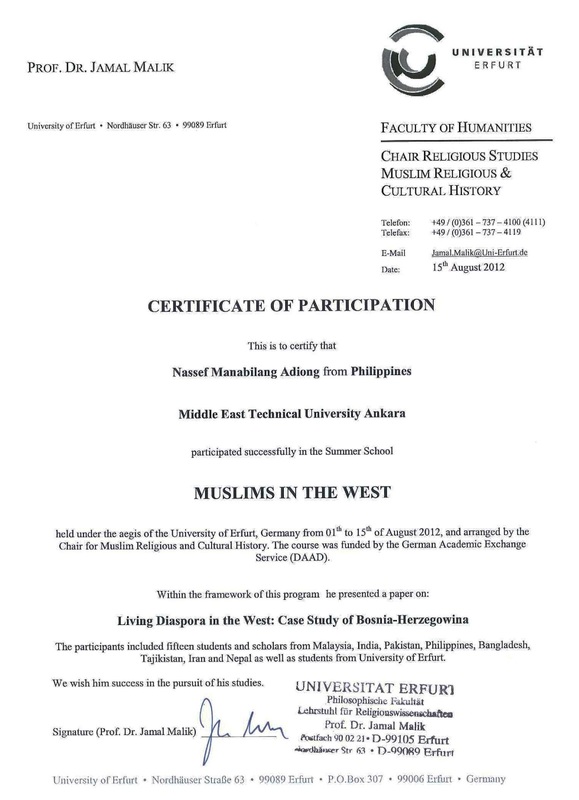 Nassef Manabilang Adiong, PhD (https://nassef.info/): Erfurt's 11th Summer School on "Muslims in the West"
Erfurt's 11th Summer School on "Muslims in the West"
In the aftermath of terrorist attacks of 9/11 the Chair of Islamic Studies participated in “Dialogue with Islam” an academic activity initiated by the German Academic Exchange Service (DAAD). 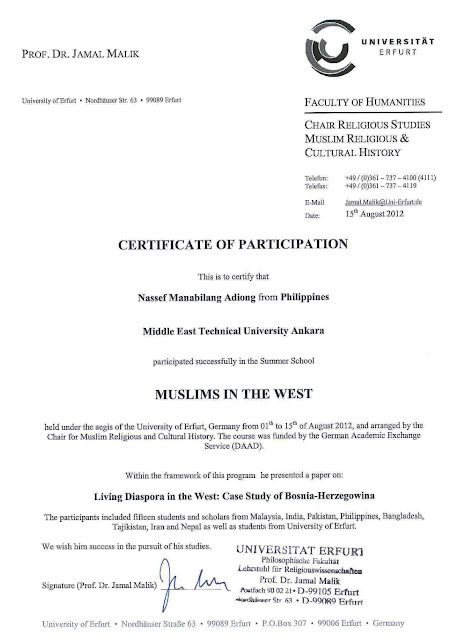 Ever since debates on “Islam and the West” has become part of the tradition of Chair of Islamic Studies. The importance of a continuous and permanent dialogue is even more obvious, as the terrorist attacks do not end, but rather seem to rise, as the latest incidents in London and Egypt demonstrate. With the initiation of the international Summer School “Muslims in the West” the Chair of Islamic Studies intents to contribute to this dialogue. Muslims from different countries and cultures (India, Pakistan, Turkey, Saudi Arabia, Iran, Yemen, South Africa, Sudan, Malaysia) have been participating for the last five years. Thus, the promotion of a direct dialogue between students and Alumni led to a better mutual acceptance, tolerance and understanding. 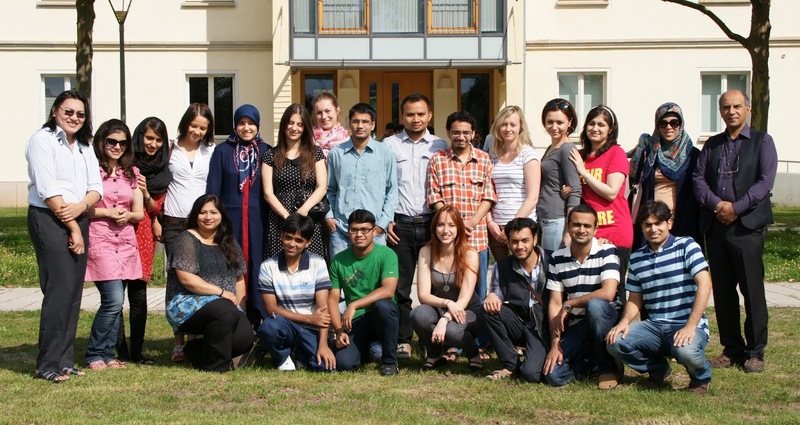 The summer school has always been a very successful vehicle not only in strengthening the dialogue, but also in increasing the international reputation of University of Erfurt. So far more than 100 students have participated in this summer school and many more have shown interest, to participate fruitfully in the ongoing mutual understanding of “Islam” and the “West”. A considerable number of Muslim migrants in Europe, especially in Great Britain and France, come from countries in South Asia, in particular, India, Pakistan, and Bangladesh, and from North Africa. The importance of these regions is further acclaimed by the fact that very large Muslim populations in the world are concentrated in these regions. Courtesy of the University of Erfurt's facebook page.